One of the most difficult things to do in today's society is to stay true to yourself and your passion when it seems the majority of the world is only worshiping that which is on the surface. I witness so many people compromise their art or who they are just for the thrill of temporary popularity. It works for now, but will it sustain? I made a vow to myself a while ago to create art that has meaning behind it and to do what I am doing because it's authentically me - not for the money or approval of others. I want to be able to wake up everyday and feel good about who I see in the mirror and the energy I am putting into the world because I know it aligns with my true self and purpose. Twenty years from now I want to read my words or look at my fashion choices and feel good knowing that I didn't sell out to please others. What I'm putting out may not always be right, stylish, or exciting to read, but what it is is my truth and my legacy. And that's worth way more to me than being validated by this world. I chose the crop t-shirt I am wearing above because it speaks to what I preach on this blog often. Creating a legacy and staying true to yourself is always greater than being liked and accepted. To check this t-shirt out and more t-shirts like this, visit KandiceGuiceCollection.com. 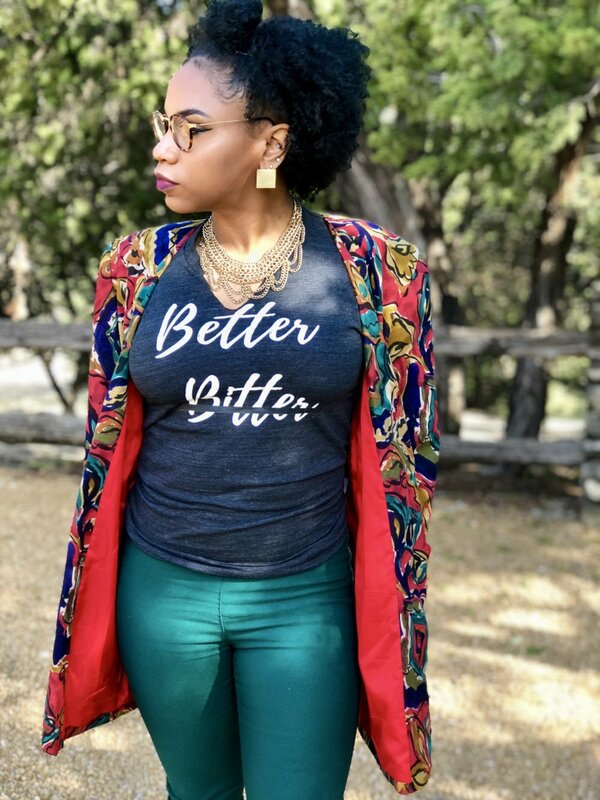 Also, see how other stylish bloggers rock their statement tees from the Kandice Guice Collection below! I believe a free mind is essential in order to live the best life you can possibly live. Freeing my mind is something that I have been working on for a while. I used to be caught up in certain standards and perceptions that I just couldn't let go, but the more I experience life, the more my mind opens up. My friend sent me a picture of some jeans that had chains attached to them. I decided to try and create my own. I hadn't worn these jeans in a minute because the cut on the thigh area was too wide. So I decided to take my chain necklace and loop it through the holes in my jeans. It worked out perfectly for me. This statement t-shirt was created by Chokolat Creme. We aim to promote liberation, forward thinking, and openness; hence, the "Free Mind Tee." I told you guys that I would start adding some pop colors to my wardrobe....boom!